With its emphasis on the budding romance between Anakin Skywalker and Padmé Amidala, it is no surprise that the love theme, Across the Stars, is the most pervasive theme in Star Wars, Episode II: Attack of the Clones. Because its association is fairly unwavering from Anakin and Padmé’s love, in this analysis I will instead focus on more subtle connections that add further depth to its meaning and demonstrate how the film’s score is unified to an unusual degree through the relationships between this theme and others in the film. Across the Stars is divided into three distinct sections that I will simply call A, B, and C. These can be heard in the recording below, A in 0:13-0:35, B in 0:36-0:56, and C in 2:01-2:26 (after another A, B, and A). Another similar example occurs when Padmé is leaving the capital with Anakin for greater safety on Naboo. 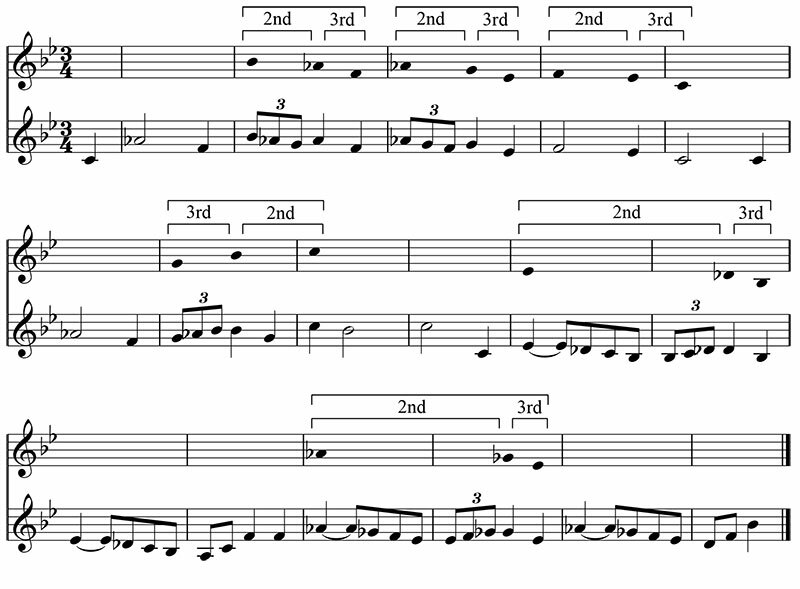 While Across the Stars has a pervasive presence in Attack of the Clones, it is but a part of a highly unified score that reuses a basic melodic shape in many of its themes. Consider the comparisons below between the love theme’s A section and these other themes, the labels for which are my own. What do all these similarities mean in the context of the film? 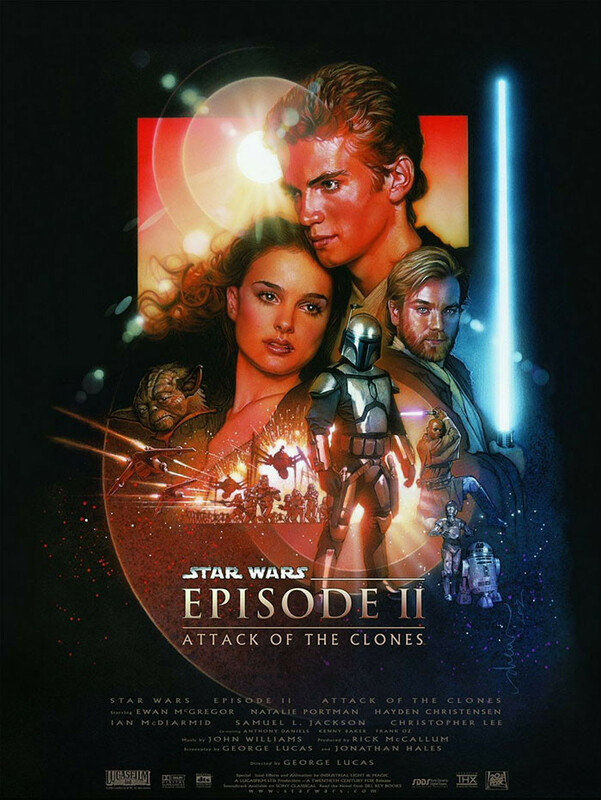 It is significant that Attack of the Clones is different from the other prequels in that its narrative is split into two large but very different parts. While Obi-Wan investigates who is behind the assassination attempts on Padmé, Anakin serves as Padmé’s protector in her retreat to Naboo, where the two develop their love. The resemblances among the themes above thus provide a means of unification in a story whose two strands have very little to do with one another, a kind of subconscious glue holding the film together. One could also argue that, because Across the Stars is the most pervasive theme in the film, these thematic connections emphasize that Anakin and Padmé’s love will have drastic effects on just about everything in the prequels’ universe. That is, Anakin’s turn to the Dark Side is grounded in his love for Padmé, without which there would not have been Darth Vader to contend with, nor the Emperor, nor even the Empire for that matter (as Anakin is the one who saves Palpatine’s life in the next film). In any case, it is difficult to overestimate the impact that the couple’s falling in love has on the saga. One could even call it the event that precipitates Anakin’s downfall. Far from being a theme that merely accompanies the expressions of love between Anakin and Padmé in Attack of the Clones, Across the Stars does much more. As we have seen, it reflects the gradual emergence of their love through the several outlined forms early in the film and the withholding of a full statement that includes the B section until Padmé’s admission of love in the film’s later stages. In addition, the theme’s C section, which is included in the fullest statement in the end credits, is detached in the film and used to suggest Anakin’s doubt about the relationship’s prospects. Finally, the theme’s reference to Luke’s theme and similarities to other recurring themes in the film suggest a tapestry of relationships that invite interpretation and help to connect Attack of the Clones to both its preceding trilogy and immediate successor, Revenge of the Sith. Coming soon… Battle of the Heroes. This a fantastic theme that Williams created for the series; it reminds me of the Han-Leia love theme that dominates “The Empire Strikes Back,” in that it is a malleable theme that can be used in a number of different ways through the film. I really like the swelling use of it at the end, leading into the credits, as it gives a strong sense that this is the ‘end of an era’ in a way. Beautiful. Thanks for taking time to help me appreciate this wonderful piece all the more! I love this theme and I think it’s great how you analyzed how it works within the film and the similarities to other themes. It’s no surprise that it is similar to other of his themes. He does that a lot. I find there are also similarities between “Across the Stars” in intervallic content and melodic contour with “Leia’s theme.” Both Luke’s and Leia’s theme bear a resemblance to their parents theme, but less resemblance to each other. A wonderfully sophisticated “family” of themes.